Atherosclerosis: Artery clogging or Corrosion? 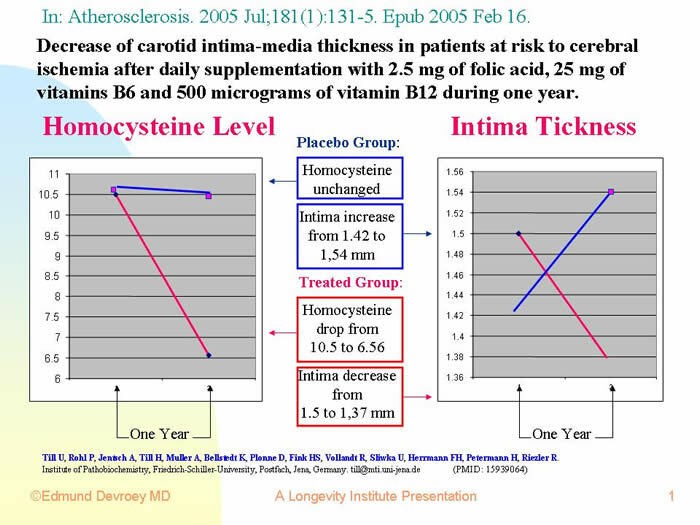 "Researchers Say Benefits Are Greater Among People Who Have Taken Supplements the Longest"
The link between a deficiency of vitamins of the B group and arterial wall inflammation by the potent oxidative amino-acid homocysteine was described in 1961 by trail-blazer Doctor Kilmer McCully as a main factor of arteriosclerosis. deaths due to stroke dropped rapidly in the US and Canada". The picture to the left illustrates the narrowing of a pipe by sludge build-up. Over the last sixty years Medicine has promoted the notion that arteries are like a body's plumbing system experiencing with time a gradual build-up of sludge. Medicine considers cholesterol (and animal fat) the "sludge" of arteries accumulating in what is named "plaque". Pharmaceutical companies have followed that trend building a billion-dollar business with drugs intended to lower cholesterol blood levels by blocking your cholesterol production in an attempt to reduce plaque build-up in the arteries. Recent studies, however, demonstrate that lowering cholesterol level by inhibition of its synthesis, does nothing to stop the progressive build-up of plaque. 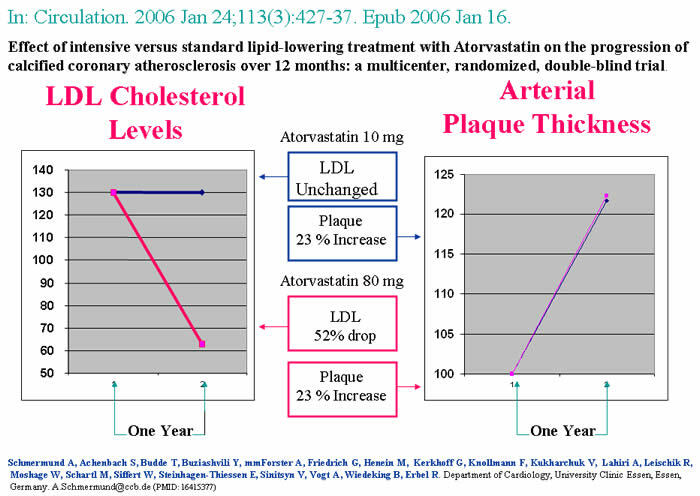 In the experiment illustrated below, people taking ten milligrams of the cholesterol lowering drug Atorvastatin calcium (Lipidor) daily for one year experienced no change in their LDL cholesterol blood level (the blue line on the left chart) while the thickness of their arterial plaque (how is this calculated) increased by twenty-two percent (the blue line on the right chart) In the same experiment, people taking eight times more Atorvastatin (eighty milligrams daily) during one year, had a significant drop in their LDL cholesterol level (the red line on the left chart) and as in the first group a similar (23 percent) increase of their arterial plaque thickness (the red line on the right chart). Cholesterol is not a poison nor is it a waste product. Cholesterol is an essential molecule in both animal and in human biochemistry. Did you know that the human body actually produces cholesterol? Yes, we make it from scratch! Almost all of our cells are equipped with the enzymes to make cholesterol. A healthy person synthesizes up to two grams of cholesterol per day. An average diet with no cholesterol restriction, adds only 500 milligrams per day to your own daily production. High total cholesterol, low HDL and high LDL levels are symptoms only-indicators of some internal imbalance. Increasing evidence is accumulating linking internal imbalances to diet excesses and deficiencies. These are the same diet excesses and deficiencies that are at the root of the health alterations traditional Medicine claims is caused by high cholesterol. Want more information on all the fallacies pertaining to cholesterol? and then have a good laugh! What is an Artery Made of? "Wikipedia", The Free Encyclopedia is a good place to find out. Take your time to visit the links in the following paragraph. The information is pertinent and well-illustrated. "The outermost layer is known as the Tunica adventitia or the adventitia, and is composed of connective tissue. Inside this layer is the Tunica media, or media, which is made up of smooth muscle cells and elastic tissue. The innermost layer, which is in direct contact with the flow of blood is the Tunica intima, commonly called the intima. This layer is mainly made-up of endothelial cells. The hollow internal cavity in which the blood flows is called the lumen"
Arteriosclerosis is carracterized by the existence of an abnormal tissue termed "Plaque" in the wall of the artery. Where in an artery does Plaque occur? 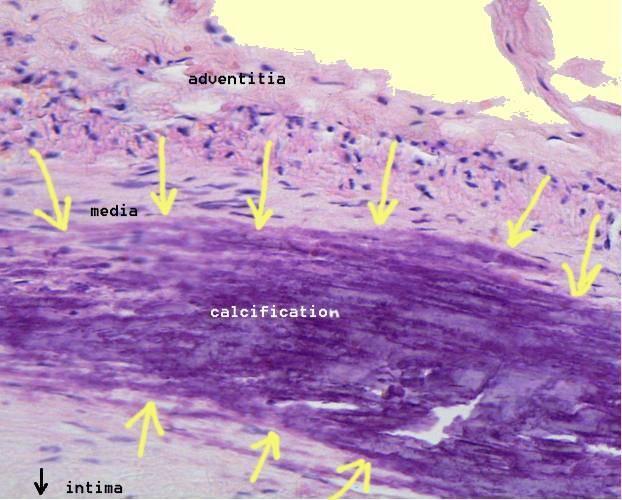 This vue of the microscopic slide of an arterial wall shows a "plaque" (delineated by yellow arrows) located in the media, that part of the arterial wall made of muscle, elastic and conjonctive fiber. Plaque contains debris of death cells (inclusive their cholesterol content) and altered elastic and fiber components. The whole rubble is sprinkled with various amounts of calcium and infiltrated with lymphocytes and macrophages. The lymphocytes and the macrophages have reached the media through the vasa vasorun (Literally "vessels of the vessels"), small arteries and capillaries permeating the media and the adventice. The Vasa Vasorun are at the center of the explanation of how plaque forms that takes into account homocysteine and inflammation. In which arteries does Plaque occur? clogging occurs first in the narrowest part of the system. If plaque resulted from the clogging of arteries by a deposit of circulating "bad LDL cholesterol" as claimed by Conventional Medicine and illustrated by a (misleading) animation video in the Crestor website, one should expect clogging to occur first and for the most in the smallest arteries. However, plaque is found solely in the large arteries, the aorta, the carotide, and in the coronary arteries. Why? What differentiates the large arteries and the coronary arteries from the rest of the circulatory system? The answer is their elastic tissue content. Elastic tissue is most abundant in the arteries where blood pressure is greatest-in the large arteries and in the coronary arteries. Elastic tissue is almost nonexistant in small arteries. AN ALTERATION OF THE ELASTIC TISSUE . Rust can invade the whole tickness of the wall. Rust is the most familiar example of corrosion. It is an oxidative corrosion of iron. Rust causes weakening of iron by degradating iron's essential properties. It also causes an overall swelling of the material. Another example of corrosion is the degradation that may occur in plastic. Although there are many forms of this sort of corrosion, the most frequent form is a decrease in length and a greater brittleness of the plastic molecules under the influence of oxidizers like free radicals. Similarly, arteriosclerosis results from the corrosion of arterial elastic fiber followed (since it occurs in a living organism, not in a metal or plastic pipe) by a chronic inflammation process. His theory was rejected by the Medical Establishment and cost him his positions at Harvard University and the Massachusetts General Hospital. However, his theory has gained strength more recently and homocysteine has become one of the hottest topics in research. McCully's book, "The Heart Revolution", describes how a deficiency of some vitamins of the B group (B6, Folic acid and B12) increase homocysteine levels and create the best conditions for arteriosclerosis to develop. DR. Mc Cully has recently further developed his theory in a recent publication together with Uffe Ravnskov, author of "The Cholesterol Myths"
In the experiment illustrated below, people taking 2.5 mg of folic acid, 25 mg of vitamin B6 and 500 micrograms of vitamin B12 experienced a 38% drop of their homocysteine level (the red line on the left chart) and a 9% reduction of the thickness of their plaque (the red line on the right chart). In the control group, the homocysteine level remained almost unchanged (the blue line on the left chart) while their plaque swelled by 9% (the blue line on the right chart). The inflammation of arteriosclerosis almost always progresses inward resulting in the narrowing of the lumen of the blood vessel and in the possible bursting of the inflammation plaque through the intima into the lumen of the artery creating the condition for thrombose and obliteration of the artery. Should the inflammation plaque develop more toward the outside of the artery an aneurysm may result. Although their exact mode of action is not always elucidated, it is well admitted that some hormones protect against arteriosclerosis and coronary heart disease. A well-known example is the protection the hormone progesterone provides to women. Women lose that protection after menopause and without progesterone they then have almost the same rate of coronary heart disease as men of a comparative age. Another hormone of great interest in protecting against arteriosclerosis is dehydroepiandrosterone (DHEA). The protection DHEA provides to arteries stems from its specific property to increase the production of elastin by arterial fibroblasts. DHEA is the first hormone to see its level drop significantly with age and this plunge constitutes another argument to consider McCully's elastic fiber corrosion hypothesis as a preferred explanation for arteriosclerosis. In animal experiments, a copper deficiency reduces the synthesis of elastic fiber and alters its composition.